With Eskom battling to keep the lights on, many South African households will suffer from load shedding at different times in the day. These blackouts may occur unexpectedly or when you least need it… here are some tips to make sure you’re prepared! Load shedding involves switching off parts of the electricity network in sequence, to ease the pressure on the power grid and ensure the supply across the country remains stable. Although it could become inconvenient and sometimes costly, it should act as a reminder that we are using valuable and limited resources. It’s time to get serious about saving and reducing your household’s electricity demand not only saves you money, but also means the load on the national power grid is reduced. This, in turn, will help stabilise the countries power supply and help keep the lights on longer. Ensure you fully charge your cellphone when power is available. Charge power-banks or spare batteries when the power is still on, so you have back-ups in case of emergencies. Keep in mind that petrol stations cannot pump fuel during power outages, so ensure your vehicle always has fuel in the tank. Have spare canisters filled with fuel in case your vehicle runs out. Make sure you have enough cash as ATMs cannot operate without electricity. Release automatic electric garage door mechanisms so you can gain access to your property during a power outage. Release electric security gates and switch to manual operation to avoid being either locked in or out of your home. Keep temporary lighting readily available, e.g. battery-powered torches and candles. Make sure you put these items in places where they will be easy to find in the dark. Get a small LP gas lamp, as it gives good quality lighting for a large area, or invest in a bright camping light you could place (or possibly hook) somewhere high. If you know when the power is scheduled to be switched off, boil water in advance and keep it in thermos flasks for cleaning, cooking or making warm drinks. Use an insulating cover on teapots and other pots and pans to keep drinks hot, and meals warm. Prepare a few meals before-hand in case of power cuts and keep adequate stocks of essential foodstuffs. Obtain a small, stand-by bottled LP gas heating ring or gas stove for essential cooking and to boil water when needed. Keep refrigerator and freezer doors closed. A power outage lasting four hours should not cause food spoilage and a freezer should keep frozen food safe for at least a day. It is also a good idea to have alternative snacks available that do not need refrigeration. Most medication requiring refrigeration can be kept in a closed fridge for several hours without spoiling (check with your doctor or pharmacist to be sure). Fill plastic containers with water (keep in mind that some space should be left in each container to allow for expansion when freezing in a deep freeze or the freezer compartment of your fridge (keep in mind that some space should be left in each container to allow for expansion when freezing). This frozen water will help keep food cold during a power outage. 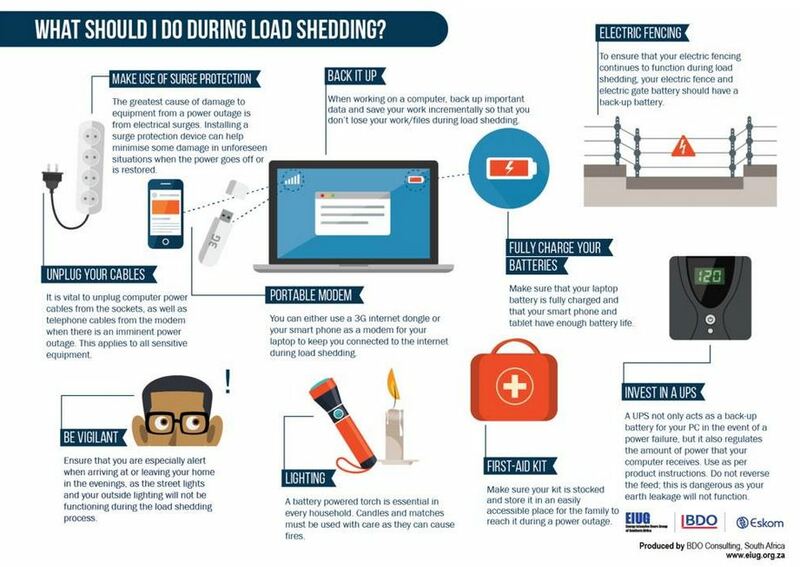 What should I do during load shedding?